Erica Bunker | DIY Style! The Art of Cultivating a Stylish Wardrobe: Review: Simplicity 1370 - Weekend Wear | The Skort! Review: Simplicity 1370 - Weekend Wear | The Skort! So... I made a skort. I haven't worn a skort in a few years. This was a regular part of tennis attire when I actually picked up a racquet and played on the regular. But I thought this would be a cute addition to my summer wardrobe. So let's talk about it! This is Simplicity 1370 and I made view A. I cut the 16, but I had to take in the waist. This pattern is cut very narrowly through the hips. And in honesty, it's probably designed for a "boyish" frame. Now this pattern is cut pretty short. I didn't even realize how short it was until after I put in the 1 1/4" hem. The inseam probably measures 2". I would love to make this pattern again because I think it's adorable. But I would make it in a dressier fabric and a couple of inches longer. Let's talk about this fabric. I picked this fabric because I was drawn to the bright color. Bright colored bottoms are so prevalent right now and I felt it would be a great wardrobe addition. This fabric is Rag & Bone's Ethereal Blue Polyester Woven from Mood Fabrics.com. And it is indeed polyester and presses as such! As in -- a nightmare! When a fabric tells you who it is, believe it the first time! The descriptions said it was polyester, 100% polyester at that and has the had of a linen with a crisp drape. A really crisp drape. Something should've clicked in my head when I read that, but I was in the midst of a moment over the color. But hey, you live and you learn. Shirt: Butterick 5526. See original review here. Even though I wish I could've gotten a smoother press on the fabric, I think this pattern is adorable. And even though I want to add length to it, the pattern company didn't think enough of anyone who wouldn't appreciated the short-short length by addint lengthening lines. You're pretty much on your own with figuring that one out. Thanks Simplicity Patterns for that! But all in all, I really like this pattern and I do plan to make it at least once more in probably a black wool blend suiting fabric (hopefully). Cute skort and love the color. this is the most leg I've ever seen you show! I love it! That's right show off that body you been working so hard for! Still working and feeling really good these days! Thanks Kimberlee! This is really adorable...something maybe I'd make now that I've seen you make it....now you talk about a a wool blend suiting fabric...what would be some great summer fabric alternatives to the poly you used,Erica? Cotton twill, linen, denim... and I bet a ponte would work great too. Thanks MB! Cute! I've seen this look in RTW a bit lately, and several weeks back I modified a pair of Esther short to make an almost identical pair as this! I had no idea this pattern was available. I love my skort, and yes, I have a more boyish frame. 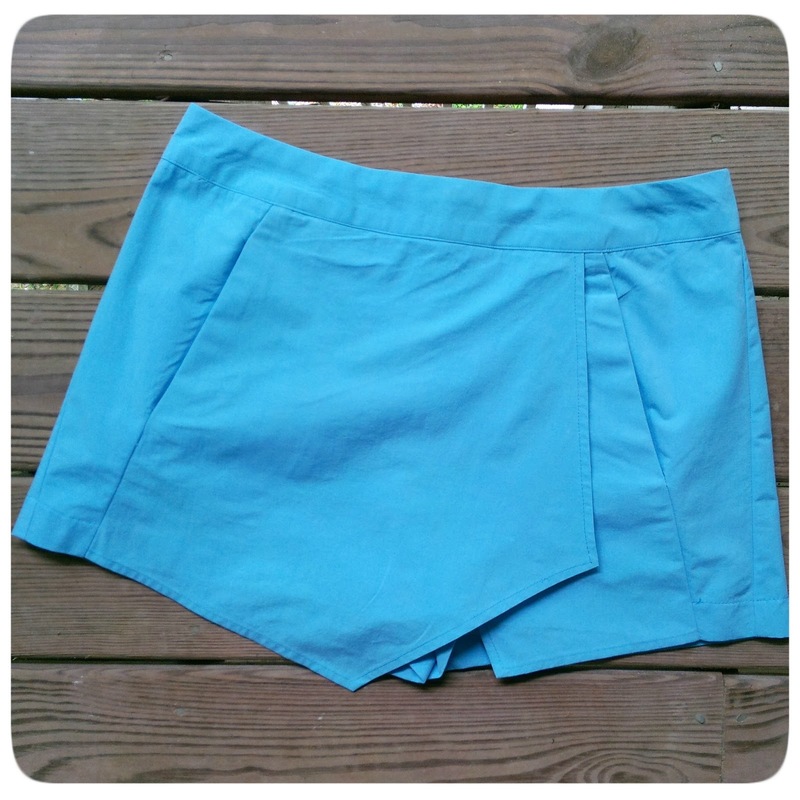 I used cotton sateen (buttercup from MOOD), which I think works beautifully in these shorts. That tiny bit of stretch to a woven works wonders! I do love the colour of yours though, and can totally see why you chose them! I made this pattern and had the same problem with the waist being a bit too big. Any tips for taking it in after it's been sewn? I would always advise to try on before attaching the waistband. But, you can extend the back darts up into the waistband. Love the color. You look great in it. Super cute, love the color and perfect with the silver sandels. Am going to have to get this pattern. So cute, you look great in these! You look so amazing Erica! Those gym sessions are definitely just enhance! This skort looks amazing! I have been trying to find the pattern at my local shops but they don't have it. Must be a sign that it is a popular design!